Properties in Calpe City Centre average 4.3 out of 5 stars. Perfect location, 2 pools, shops & beach! Property 9: Perfect location, 2 pools, shops & beach! 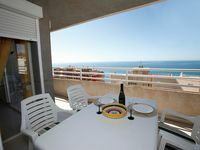 Costa Blanca Calpe Beautiful apartment on the beach !! Property 19: Costa Blanca Calpe Beautiful apartment on the beach !! Great Apartment, with wiffi, a / a, next to beach and promenade. Property 28: Great Apartment, with wiffi, a / a, next to beach and promenade. Nerea LAST MINUTE OFFER! FROM 17/11 TO 01/12 ASK FOR PRICES! Property 33: Nerea LAST MINUTE OFFER! FROM 17/11 TO 01/12 ASK FOR PRICES! Good sea views with a spacious terrace.